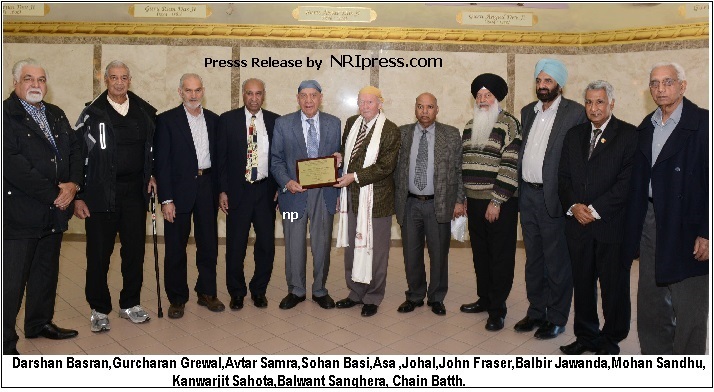 India Cultural Centre of Canada’s Gurdwara Nanak Niwas on Number Five Road in Richmond honours prominent members of the Indo-Canadian community as well as from the community at-large. Thus, it was a matter of great pleasure for Chairman Asa Singh Johal and management committee of the Gurdwara to welcome and honour a very well respected retired Canadian parliamentarian. John Fraser was born in Yokohama, Japan where his father was serving at the time. He moved back to Canada at a very young age and did all of his schooling in Vancouver. John received his Law degree from the University of British Columbia in 1954. After practising law for a few years, he decided to enter politics under the Progressive Conservative Party banner. John Fraser was first elected to the House of Commons from Vancouver South riding in 1972. As a result of his hard work and popularity, he was re-elected as Member of Parliament in 1974, 1979, 1984 and 1988. He served as Minister of Environment and Minister of Fisheries and Oceans under Joe Clark and Brian Mulroney Administrations. In 1986, John was elected as Speaker of the House of Commons. As a matter of fact, he was the first elected Speaker of the House. John served in this position till 1993 when he retired from politics. He was instrumental in setting up the Public Information Office of the Parliament of Canada. John’s dedicated service to Canada earned him various honours including Order of Canada and the Vimy Award. 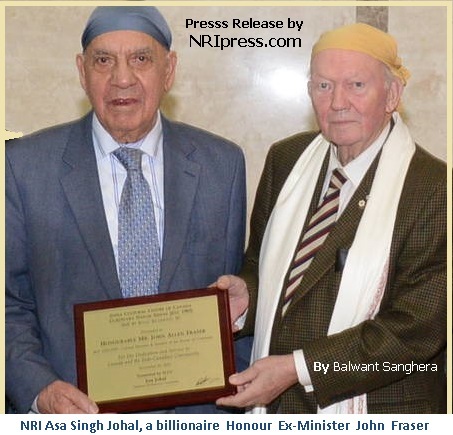 John Fraser was very well connected with the Indo-Canadian community. He was always upfront in helping those in need. His riding was home to a fairly large segment of Indo-Canadians. In early seventies a lot of visitors from Punjab arrived in Canada. John was instrumental in getting them accepted as landed immigrants. He fondly recalls his association with our community and prominent members of our community like Asa Singh Johal and Jack Uppal. As a matter of fact, Mr. Fraser attributes a lot of his electoral success to his connections in the Indo-Canadian community. Gurdwara Nanak Niwas General Secretary, Mohan Singh Sandhu, welcomed John to the Gurdwara and thanked him for his dedication and service to the Indo-Canadian community and Canada. In his brief remarks to the congregation, John Fraser thanked Chairman Asa Singh Johal and the Gurdwara Management for honouring him. He shared some of his experiences while growing up in Vancouver as well as his political career. John recalled the ugly face of discrimination and racism prevalent at that time and the progress Canada has made on this front. “We have come a long way from those times. We are all Canadians. No matter where we came from, we should all take pride being the citizens of this great country. Let’s do whatever we can to make Canada even a better place to live. We all love Canada”, said the veteran politician. He commended Justin Trudeau and his government for opening Canada’s doors to Syrian refugees. John also commended BC’s Sikh community for stepping forward to help the Syrian refugees. He also called upon everyone to do whatever we can to stem the flow of climate change and improve our environment. In addition to the members of the management committee of the Gurdwara, John was also greeted and welcomed by a number of prominent members of our community including PICS CEO Charan Pal Gill, Sarwan Randhawa,Avtar Samra, Khuspal Gill and Dr. Gurnam Singh Sanghera. Charan Pal Gill and Balwant Sanghera joined Mr. Sandhu in thanking Mr. Fraser for his valuable contribution to Canada. It was a very fitting tribute to an outstanding Canadian.